NOTE: This particular subject is of great interest to me because its exploration leads the logical person to question the very foundations of modern farriery. Foolishly, I began the writing process thinking I could say what needed to be said in a single post. But after I started putting my thoughts down, it quickly became evident there was no way I could accomplish what I’d set out to do with only one post. And so I’ll be presenting it as a series of articles instead, beginning with some anatomical and biomechanical background theory and concluding with the consequences of artificially manipulating hoof angles. As I mentioned in Off His Rocker(s), many horse people place a great deal of emphasis on hoof angles. 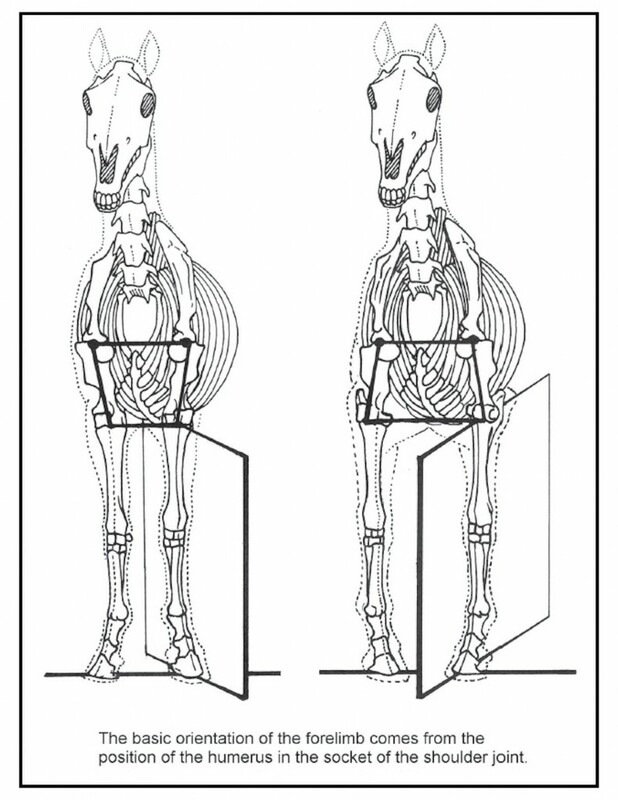 Owners think a particular angle is important for proper movement, or that the angles of hoof pairs must always match. Veterinarians and farriers are forever trying to enhance movement or increase comfort by deliberately manipulating hoof angles, which is accomplished by adjusting the relative amounts of bearing surface hoof wall at the toe and heel buttresses (“heels”) and/or by utilizing wedge shoes and/or wedge pads. 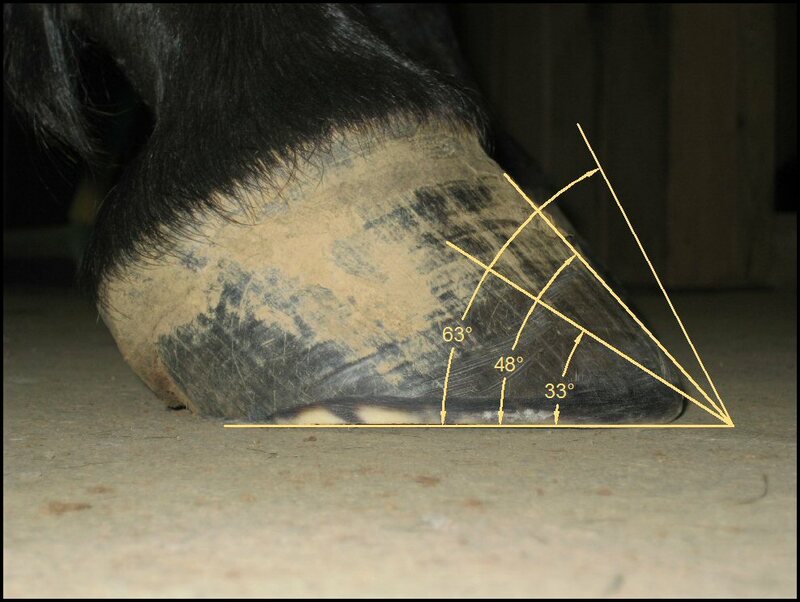 Adding (or not removing) length at the toe relative to the heels will lower the angle, while (more commonly) adding or not removing length at the heels will increase the hoof angle. And yet, these angles are not arbitrary. As you’ll learn, there is only one correct angle for every horse’s hoof, and artificially varying that angle is not without consequences. But more on that later; we’ll spend the rest of this post covering some necessary background information and relevant terminology. This path is known as the flight arc. Note there are several interesting things we can learn from this photo. First, the flight arc is fairly shallow, with no large excursion off the ground. This, of course, varies with the breed and conformation of the horse, but like many other horses, this horse has much more forward motion than vertical height apparent in the flight arc. Second, you’ll see that the gentle peak in the flight arc occurs soon after the hoof leaves the ground. And third, notice that the rear hoof’s contact point with the ground is slightly past where the front foot began its flight. Notice how smoothly the hoof lands – perfectly flat – and then leaves the ground. The breakover (time) is the time difference between when the heels leave the ground (frame 7 in the top sequence) and when the toe leaves the ground (frame 9 in the top sequence). Keep in mind that it’s not possible to calculate exact times and positions from these video excerpts because each frame is 1/30 of a second apart, and motion has occurred in between the captured images. Another interesting phenomenon apparent in these video stills is the blurring due to motion, most prominent when the hoof is farthest from the ground. That’s because the hoof decelerates to near zero as it prepares to make contact, and accelerates again as it moves higher in the flight arc. The reason for identifying these particular movement parameters is because these are the characteristics veterinarians and farriers endeavor to change through trimming and shoeing: the stride length, the flight arc, the landing, breakover time, and the plane of limb movement. Most of these are thought to be connected directly or indirectly with hoof angles. Over the next few posts, we’ll examine whether or not these connections are real, and see what the data actually tells us about changing, or attempting to change, these gait characteristics. Unlike the previous two examples, you’ll see this horse literally “slams” his feet down, even at the walk. And most importantly: this bad landing cannot be detected under normal viewing conditions. To the eye, this horse appears to land perfectly fine; it’s only when capture the movement on video and slow it down do we see just how bad this landing really is. Think about the implications of that next time someone tries to convince you that you should see a horse land heel-first! Share the post "Hoof Angles – Part 1"
Are you saying that I can’t fix my elbow by trimming my fingernails?? This is all helpful information. Photo’s are particularly useful in understanding better hoof care. Thanks, Judy. I agree – the old adage about a picture being worth a thousand words is most definitely true! Where do I start… My horse has some mystery off-ness. I’ve gotten opinions from horse folk, vets, shoers…done chiropractic in the back, hock injections and still…it aint right. Her front left heel is almost 1/2″ longer than her right, yet her angles after 8 weeks only vary by 1 degree. My shoer swears that it’s ok. I can’t fathom how and am looking for input. Have any? She has a slightly shorter stride with and mildly drags the left front which makes sense to me as that’s the higher heel. Shoer swears she has suspensory damage in that foot and that’s why she’s dragging and couldn’t POSSIBLY be the heel difference. I disagree. Any input would be appreciated. Obviously, diagnosing a horse via “remote control” isn’t even close to ideal! But based strictly on what you’ve said here, I suspect you’re correct – the hoof is just plain too long. If they were very different angles, I’d have a different opinion, but since they’re not, and since she’s dragging it, that seems the most obvious cause. I don’t know offhand why a suspensory issue would cause her to drag it; I generally think of suspensory issues as causing problems with suspension (weight-bearing)! I was wondering if you studied photos or videos of Mustangs with their natural toe roll & self trimmed hooves to see if they indeed land flat or very slightly heel first? To me that would be the true demonstration of your theory verses that of other natural hoof care professionals. Unfortunately, none of the mustang videos I have contain good images of landings on flat terrain. I agree it would be a great way to support my premise, but I think if follow along with where I’m headed, you’ll come to the same conclusion. Actually, Evie, that’s not necessarily the case. The “correct” angle is the angle that places the leg’s bones/joints in proper alignment. Although it usually matches the angle of the shoulder, that’s not a given. And an improperly-trimmed hoof wall (with excess thickness) can also make the angle appear to be incorrect. Frankly, Deb, I’m quite surprised that a Foxtrotter would truly have navicular disease unless: 1) he was used extensively on very hard surfaces, particularly while wearing shoes and/or with grossly incorrect hoof angles, or 2) he was used extensively for jumping, particularly show jumping rather than something like cross-country. Navicular disease is a disease of misuse/overuse under the conditions I mentioned, so perhaps it’s actually something else. What are the negative implications to my Arabian mare who was trimmed 45 on front & 43 on rear? I do barefoot only. As I try to make clear in this series of Posts, there’s no particular “right” or “wrong” angle – it’s entirely dependent on the conformation of the specific horse. So, unfortunately, I can’t give you a definitive answer. What I CAN say is that you should never trim to obtain a particular angle; the angle is the consequence of trimming, and cannot be the goal of successful trimming. Hope that helps!